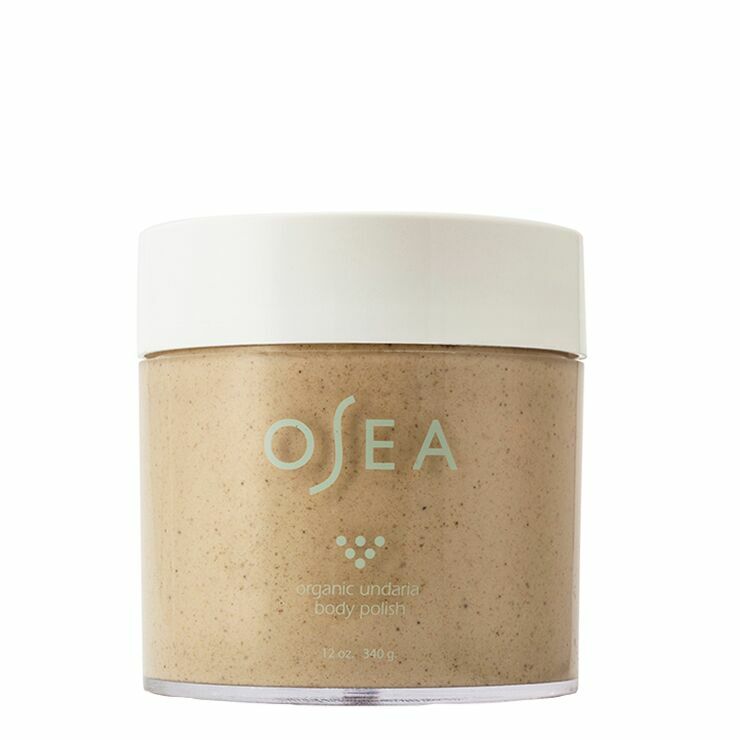 Get ready to experience your silkiest feeling skin ever with Undaria Body Polish by OSEA. Fine-grained acai and guarana seed powders are used to address signs of rough texture, dullness, and dead skin build up, providing a feeling of super smooth skin in a gentle scrub. Algae makes skin feel soothed and hydrated, reducing the appearance of redness, dryness, and irritation. Hemp and passion fruit oils diminish the look of lines and wrinkles, and lend a look of supple youthfulness. Lavender offers a sweet aroma to soothe and relax the senses. Gently massage scrub onto damp skin, using a circular motion to promote a smooth feel. Rinse with warm water and follow up with your favorite body moisturizer. Use weekly for skin that looks and feels soft, hydrated, and luminous. Aqua, Sorbitan Olivate, Glycerin, Pumice*, Undaria Pinnatifida*, Cannabis Sativa (Hemp) Seed Oil*, Lavandula Angustifolia (Lavender) Oil*, *Chlorella Extract, Glyceryl Stearate, Gigartina Skottsbergii Extract*, Euterpe Oleracea (Acai) Powder*, Paullinia Cupana (Guarana) Seed Powder*, Resveratrol, Macrocystis Pyrifera Extract*, Lessonia Nigrescens*, Salicornia Europaea*, Oryza Sativa (Rice) Powder*, Passiflora Edulis (Passion Fruit) Seed Oil*, Oryza Sativa (Rice Bran) Oil*, Euterpe Oleracea (Acai) Pulp Oil*, Orbignya Oleifera (Babassu) Seed Oil*, Melissa Officinalis (Lemon Balm) Oil*, Lonicera Caprifolium Extract, Lonicera Japonica Extract, Guar Gum, Xanthan Gum, Citric Acid. I really love this polish - and I'm not normally a body scrub/polish user. I usually find similar products leave too much of an oily residue on me/my shower and I end up feeling like I want to wash off again after using one. However, this Osea polish has just the right balance of oil so when I step out of the shower my skin feels lightly moisturized and silky smooth but not overly oily. Best scrub ever !! I’ve tried a lot of scrubs this by far really did work. I use this scrub right before I go in the shower, that’s how I see the best results. Dislike scrubs? You still might like this. In general, I am not a fan of physical exfoliation for the face, but a gentle physical exfoliator for the body can be nice. This one is pretty good from my perspective. I like the lavender scent. The exfoliating bits are not harsh at all, especially because they are contained in such a creamy base. But I didn't get dramatic results, either. There is an obvious trade-off there. If you want light exfoliation, this would be something to try. I LOVE a good body scrub, and the texture of this one is pretty decent, but the scent is just horrible. I LOVE all natural products and their smells, usually....but this one is just too dang much for me. I used it and immediately used soap to get the smell off of me because it was just too earthy for me. I also like my scrubs to be a little "rougher" or have more of a grainy texture and this one is definitely more for those who like a gentle exfoliation. Just not for me. I was also a little disappointed to see this brand again (I know...it is a hit for a lot of people) as my skin just doesn't care for it and tends to act out when I use the line. This product feels luxurious just by looking at the lovely glass jar. I read somewhere that this product works well applied to dry skin, so I went ahead and tried it like that. Applying a scrub this way really makes the product go further, and in this case was a great suggestion, as you don't want globs of it falling off and going down the drain before you've even had a chance to rub it on your skin. I have really dry skin, and this product still worked, even though the texture is really fine. My skin felt amazingly soft afterwards. The smell is great too. I will definitely buy this product again in the future.